Today I finally make my way to Van Pelt Library, one of 15 (15!) libraries on campus (it is right by the gigantic broken button, if you're looking for it). The Penn Library holds more than 5 million printed volumes, 3.8 million items in microform, and subscribes to more than 40,000 current serial subscriptions. The Library's print collections are growing by approximately 110,000 volumes per year. New acquisitions are selected from scholarly and literary works published in North and South America, Europe, Asia, Australia, the Middle East, and Africa. What finally brought me to this Ivory Tower bastion of knowledge? Was it a thirst for knowledge that only one of the finest Research University's Libraries could quench? Was it a soul-crushing guilt that I have been working in a place with 15 libraries for over a year and a half and I hadn't visited one of them (and I call myself a bibliophile)? I wanted to read Partly Cloudy Patriot by Sarah Vowell, so I checked the library's catalog, and lo and behold not only was there a copy, but it wasn't checked out. I read it tonight, and all I can say is, sign me up; the obsession continues! The nice thing about Philadelphia is that no one has moved there to find the good life in over two hundred years. Oh, and she used the word 'oeuvre' (read this post for the significance). Seen at a local Wawa. 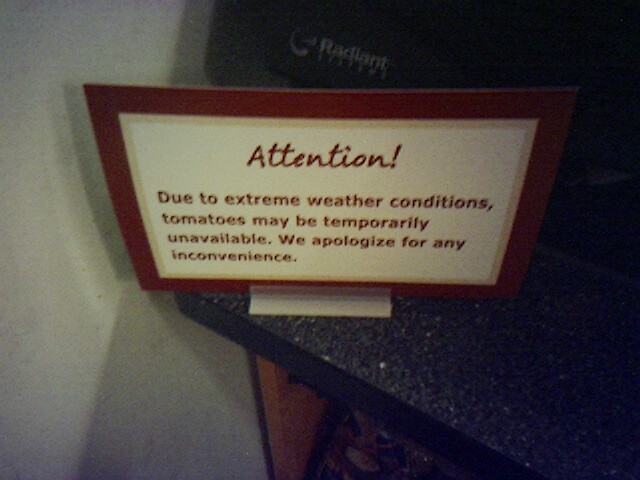 UPDATE: I found out from Julie, who found out via Kim, that eateries usually pay about $13 a crate for tomatoes. Thanks to the recent hurricanes (thanks, god! ), the price of a crate of tomatoes now hovers around $70. I think I may have to buy a few thinks from Thinkgeek this month. But Macs never have problems, right? Some people will try and tell you that Macs never encounter any problems. This is far from true, as with any complex piece of equipment you can be assured that at one time or another you will encounter a problem with your Mac. If you are fortunate enough to live near an Apple Retail Store you can lug your Mac to the store and have a Genius give it the once over. This free, personal tech support is almost unheard of in this day and age of building call centers in India, and creating complex phone menu systems that try to confuse you out of talking to a real person. There are long lines at the bar, and patrons are not waiting for Long Island iced teas. They’re waiting for coveted time with an Apple Genius. I have toyed with the idea of trying to become an Apple Genius, but having never worked retail, I think I want to stay away from it. I will just have to settle for being a plain old genius. I work with a bunch of geeks, so you would think that an internal blog would be a big hit. However, the first attempt at my workplace seems not to have caught on, and I am not too sure why. Google seems to be having the opposite experience. I still have hopes that internal blogging will pickup some steam in my shop (and perhaps it has in areas I know nothing about). Tomorrow at the office I am going to make one of Joseph Palmer's Paper Airplanes, on a break of course. According to several manufacturers and analysts, the prices for L.C.D. flat-panel TV's will drop in the new year, falling by as much as 30 percent by the end of 2005. The prices of plasma flat-panel TV's are also expected to fall significantly. Kenneth Chang is a colleague who recently sold me his iPod. After just a few months, he needed one with more storage. The beauty of the thing is that it lets you carry all of your music with you, thousands of songs. It's like having a radio station that plays the music of my life: WJHN. After buying the slightly scuffed block of plastic and metal, I was ready to load my songs. But then I stopped. Ken had left more than 3,000 songs on the iPod, and a quick scroll through them showed that there were a lot I didn't own, and many artists I'd never listened to, like a band called "The The," with a wonderfully brutal song, "Armageddon Days Are Here (Again)." I like to think I present an innocuous, well-socialized face to the world - nothing for anyone to worry about. But if you know that I like the Canadian band Moxy Fruvous (raucous, four-part, leftist harmonies) then you know a little something else about me. You've gotten a new data point. If you have all of my songs, the points coalesce to form a picture, an intimate one that doesn't quite match the public persona. I like Moxy Fruvous, and I like my iPod, but mostly I think my iPod would tell you that I am a big fan of They Might Be Giants. I am not sure what the point of BlogBites is, other than being like sound bites, but without the sound. I thought I would link to this because I enjoy a clever title: Philadelphia Inquirer: Aisles to go before they sleep. I am tinkering with the idea of starting to write from fun some more (other than this blog), and so I can relate with this. However, I have been fortunate enough never to have had writer's block when I write fiction, and very rarely with papers. My theory is just get it out and edit later. Too bad I tend not to edit later, as you can see from this blog. "MacLibrary X is a cataloguing application that stores information about your collection of books, movies, music and games. It also tracks borrowers and suggests other, similar products that you may like. Product images, descriptions, and other metadata may be pulled from Amazon.com or entered manually." That sounds like a pretty boring product, doesn't it? 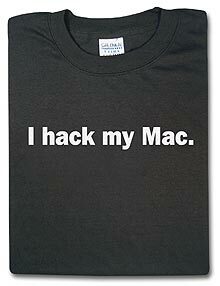 In fact, it sounds like a good first project for a programmer just starting to learn how to create Mac applications. Not surprisingly, there are many Mac OS X applications that do more or less what's described above. Why does something like this even warrant a review, let alone a review at Ars? Let's start with the actual product name. It's not "MacLibrary X" or anything similarly predictable. The application is called Delicious Library. That sounds...odd. On the other hand, it's also slightly intriguing, maybe even fun. The formal request for reconciliation to the Vatican has come from an English-based sept and is signed by the "Council of Chaplains, for and on behalf of the acting Grand Master". The letter asks for "an apology from the Vatican for the persecution of our brothers of the Knights Templar and the torture and murder of our leadership, under Pope Clement V during the 14th century AD". On the other hand, because The Complete U2 contains every album and single, a good number of the “445 tracks” are duplicates. Not just slightly different versions, but identical copies. For example, the single version of “One” appeared on the album Achtung Baby, the single One, and the compilation The Best Of 1990-2000, so it appears three times in the box set. But it’s not the only one — a quick survey reveals at least 23 songs that have two identical versions in the set, and another 12 that have three identical versions. (There may be others, as well — these numbers come from comparing identical files. Sometimes the same song appears one or two seconds longer or shorter when included on a different album, so these numbers may be higher.) Perhaps the “445 track” tally should more realistically be listed as 398? An interesting read to be sure, especially that bit about duplicate songs. Educated successful white male seeking a woman who has never completed college. Prefer a high school or community college drop out. A woman whose main goal in life is to get married and raise children, not be some cold-white-collar-corporate type. Personally I find educated, intelligent, successful women are impossible to get along with. They are obnoxious, spoiled and have no domestic skills. In short these women are poor marriage material and would make terrible mothers. Personally, I likes my women educated. I like to argue, and arguing is no fun with someone who doesn't share the same oeuvre with me is hard. Oh, and the woman for me has to be able to deal with the fact that I use words like oeuvre creatively, a tall order to be sure. I guess I might be cool afterall, what with living near Rittenhouse Square, which is sixth on this list. Actually, what this means is that soon I will probably not be able to afford to live here. Hurrah! In other words: within five minutes of meeting her, I was pretty confident that one day Sarah would get cast in a huge Pixar film as a teenage superhero. I was even going to have a bet on it. Honestly. I can't remember now what stopped me. Looking at the blurbs on the back of Sarah's first book, published in 2000, I now see that most of her friends and admirers knew this was coming. Lawrence Weschler described her as "equal parts Betty Boop and Dorothy Parker", while Steve Erickson - and this is spooky - decided that she was "original, funny, bracing, pixilated". Sarah Vowell has clearly always been a cartoon waiting to happen. I need to read this woman's books. Of course, I need to read the 60 or so other books that I have purchased and have yet to read. What do I do with all my time? Then I got an email from the producer. It was just the sort of left-field - that's a baseball term, so insert some crickety British phrase if you'd like when you go back and start putting a bunch of extra letter U's in my words - offer I turn down without blinking. But it was from Pixar. They're the best at what they do, the most universally culturally revered. It's like if Nelson Mandela showed up asking for your help to fight racism. Maybe fighting racism isn't normally your thing. Maybe you're more of an armchair racism hater. But if Mandela was standing at your door asking you to get on the bus, you'd just start putting on your shoes, right? How could I not be intrigued by this woman, I ask you? It isn't easy being green. It isn't easy getting on a U.S. postage stamp, either. Kermit the Frog will manage it next year, along with Muppet friends (left). New stamps also will recall President Reagan, singer Marian Anderson, actor Henry Fonda and songwriter E.Y. "Yip" Harburg, notable scientists, famous Marines and sports cars, the U.S. Postal Service said yesterday. It took me a little while to decide which stamp to feature on this post, because I figured it would reflect on me. I suppose I am the most like Fozzie, so I went with him. We both like to tell bad jokes, and we both think we're funny. Gonzo was a close second. What Muppet are you most like? See, it isn't as easy as you first think! The Great Pepsi Ban of '04 is set to become the Great Pepsi Ban of 04/05, and this is a good thing. The Pepsi Spice Project is the blog of someone who purports to drinking nothing but Pepsi Holiday Spice for 45 days. I say 'purports' because something tells me this is a hoax, however, I'll tell you what isn't a hoax. I want some Pepsi! But, I won't have any because I must remain strong and ever vigilant. Looking for gift giving ideas? Who better to turn to than a bunch of designers you have never met? Go check out the PlainSimple.org Holiday Gift Guide because the only way people know you care is if you give them the prefect gift. Joey posted about Textbook Disclaimer Stickers a few days ago, and I am just getting to linking to it. Thanks to Brownian Movement a small mystery has been solved. A few weeks ago I was walking home with my dinner from my favorite neighborhood chinese restaurant (I am sure there are better places, but I am a sucker for their dumplings. Plus, the woman who works the counter knows what I want when she sees me. 'Beef with broccoli?' is how she usually greets me) and I encountered a somewhat odd occurrence (or so it seemed at the time). Coming down the street, making a lot of noise, were hundreds of people on bikes. Some took the chance to yell at me, 'Ride a bike!' I tried to explain that at the moment I was holding a bag of chinese food, and I was not in possession of a bicycle, so their suggestion was suspect at the least. However, they rode off before I could retort leading me to believe that I was just the victim of a drive-by rhetorical command. It is a ride through the city to celebrate and remind everyone about the use of the bicycle as an effective means of transportation. I don't know if yelling at pedestrians is the best way to accomplish this goal, but I give them a hardy 'here, here,' and a tip of the hat. The last time I rode a bike, it was my brothers. I was home from college, and enjoying a summer weekday at home. I was bored, so I thought I would take my brother's bike out for a little ride. Now, I hadn't operated a bike in a long time, but you never forget to ride a bike. I got the helmet on, jumped on the seat, and promptly lost control of the bike. I blindly crossed one of the major roads of Yonkers (which I happened to live on at the time) and plowed into a parked car. I then fell over. Is it wrong that I, a 'grown' 'man,' want to see The SpongeBob SquarePants Movie? I have enjoyed the television show every time I have seen it, and the movie is getting good reviews. In the wake of the recent election, there's been some talk of healing, but until today no single figure has emerged with the capacity to repair the deep fissures in the body politic. We are so hung up on blue states and red states that our only hope may lie in the primary color that has been left off the map. We need something -- or someone -- yellow, and also absorbent and porous enough to soak up the ill will and scrub away the lingering bad feelings. Now more than ever, the country needs SpongeBob SquarePants, and starting today, in theaters everywhere, he answers the call, with a big-screen rendition of the nautical nonsense that has been delighting Nickelodeon viewers -- including a great many grown-ups without the alibi of children -- for the past five years. If SpongeBob's nautical nonsense, the brainchild of Stephen Hillenburg, is generally not something you wish, then you may find the 88 minutes of ''The SpongeBob SquarePants Movie'' unbearable in their aggressive, puerile whimsy. True aficionados, on the other hand, will leave wanting more. And the soundtrack (opens in iTunes) looks like it is a lot of fun as well. This reminds me of some poetry I wrote during college. I had just attended an open mic night, and was appalled by all the horrible poetry that was earnestly recited by serious minded students. I am sure they thought their work was good, but it wasn't. So, I got to thinking, if people could write bad poetry when trying for good poetry, what would happen if I wrote intentionally bad poetry? Would it be good? Turns out, it wouldn't be. 3. There is a new, annoying trend in tailoring of sewing the tailor's label on the outside. The wearer thinks he is being cool and hip, when in fact the message he is sending out is "I know nothing of suits, tailoring or anything of substance, really. I'm a clueless nonentity who's desperate to be taken seriously by his equally unremarkable hipster peers." Metaphorically, Apple wears its label on the outside. And it appeals to people who do likewise. People, let's face it, operating systems aren't cool, and they never will be.